Deadpool has faced many foes over the years, but not many are as ridiculous as this one. Deadpool #6 sees Wade Wilson totally unmotivated to take on his assassin duties. He spends the whole day going around wordlessly, only to be interrupted by some sort of a marked assassin. The nameless assassin reveals that they have bullets capable enough to neutralise mutant abilities. However, his attacks on Deadpool keeps getting interrupted in ridiculous ways. They get attacked by a giant monster, faced earlier by Fantastic Four, beamed up into space by cyborgs and sent into another dimension by Stephen Strange. Ultimately, Deadpool is confronted by the villain while he’s drinking in a bar, holding a gun to his head and throwing him around. 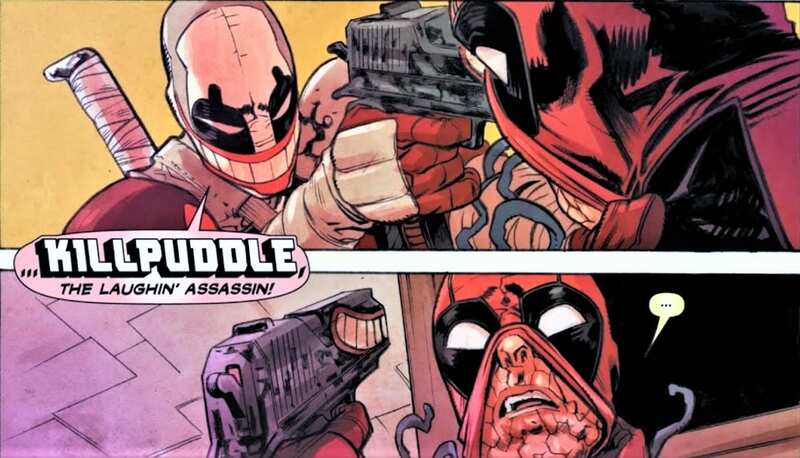 As they explain, Deadpool stole their thunder causing their assassin jobs to stop. He then revealed himself as Killpuddle, The Laughin’ Assasin. Wade finds his name hilarious and snaps out of his funk. He soon leaves the bar, leaving a few grenades inside to make sure than Killpuddle dies inside. While Killpuddle may not have impacted Marvel in a drastic way, the notion of a first draft version of Deadpool is compelling and amusing, judging by the pop culture impact of the character today. We hope that this isn’t the last time we see this character for sure.